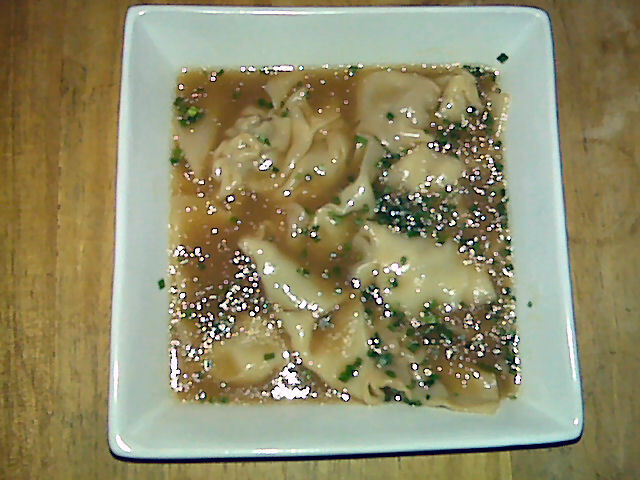 I had mentioned that you can make wonton soup from those gyoza the other day. It is so simple and so tasty. I consider this almost one of those recipes without a recipe like Micheal Smith does. Once you have the base for the wonton soup you can build it up any way you want. Combine broth, water and soy sauce in a pot. Bring to a boil. Add the gyoza and bok choy. Reduce heat and allow to simmer for 20 minutes. Serve topped with a tablespoon on green onions. This makes four servings of soup (broth and four dumplings). Each serving contains 125 calories, 9 grams of fat, and 1 gram of fiber. That covers the base of the soup. Beyond that you can add all sorts of things. I have seen wonton soup with thin slices of bbq pork, broccoli florets, carrots, celery, bean sprouts, cabbage, and even a poached egg! Just add those calories and such to your base soup and go nuts creating your own house style wonton soup. This entry was posted in Comfort Foods, Dinner, Lunch and tagged Soup. Bookmark the permalink.